Gary C. Evans (above, inset) the founder and CEO of GreenHunter Energy, came into the renewable energy field after a successful career in oil and gas. GreenHunter Energy's operations include a newly converted biodiesel refinery in Houston, Texas (above). GreenHunter Energy, while fairly new to the alternative energy space, is a company in a hurry and already has a large portfolio of renewable energy businesses including the largest biodiesel refinery in the United States-and an ambitious goal to achieve $1 billion in annual revenue within the next several years. GreenHunter Energy may be new on the alternative energy scene, but since the Texas company's startup in late 2006, there's been no stopping them. The company's goal has been to grow and generate revenue through a variety of alternative energy sources-wind, biomass and biodiesel-and that's exactly what it's done. It currently owns and operates the largest biodiesel refinery in the U.S., two biomass and 10 wind development projects, and is negotiating on future facilities.
. is a more appealing investment for Wall Street due to its diversification. The business model is paying off, notably on the last point-in its first year the company's stock rose 310 percent. Gary C. Evans is the founder and CEO of GreenHunter Energy, and came into the renewable energy field after a successful career in oil and gas. "When I sold my company-Magnum Hunter Resources-in 2005, I had a two-year non-compete, where I couldn't do anything in the oil and gas sector," explains Evans. 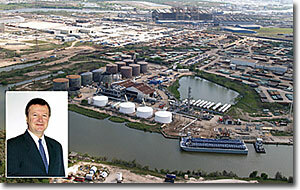 In the conversion of a waste oil and chemical refinery to a biodiesel refinery (above) in Houston, GreenHunter Energy was able to utilize about 60 percent of the existing infrastructure such as barge facilities, water facilities, foundations, existing tanks, and other associated equipment. And during that time, he began researching investment opportunities in China. "It was through those travels and seeing a side of the world that I had never really known that I recognized their unwavering thirst for energy was going to be almost unsustainable," he says. "I felt like oil prices would move up markedly, which would in turn allow the renewable energy industry, which requires a certain level of crude oil prices to work, to begin to germinate and be a viable business." Evans, with eight years' experience as a banker and 15 years experience on Wall Street, knew what it would take to make GreenHunter Energy an appealing public vehicle-diversity and businesses that would make money. "There are a lot of different renewable pieces to the whole alternative energy space-some good and some bad, and most very difficult to understand. So we felt that giving Wall Street an opportunity to buy a portfolio of renewable assets would be appealing," says Evans. "The idea with our portfolio approach is that there are certain businesses that will be very predictable with respect to the revenues and cash flow and earnings-wind and biomass. Biodiesel, though, is going to be very volatile because it's a commodity. You're dealing with oil prices and whatever they are dictates diesel prices, and that's going to directly correlate to biodiesel prices," he explains. "So what gives us a neat, safe approach for an institutional investor is that we have this portfolio where we can handle the peaks and the valleys. And then some years we'll be hitting the ball out of the park with respect to our biodiesel segment." The portfolio did appeal to Wall Street investors. The company has been traded on the American Stock Exchange since it went public in January 2008. GreenHunter Energy currently has three lines of business, with a fourth line-geothermal-that will probably be added by the end of 2009. The company's first purchase was a waste oil and chemical refinery in Houston, Texas, in April 2007. The idea was to convert it into a biodiesel refinery-the largest in the country-with a 105 million-gallon annual capacity. The company wasted no time. A year later, in June, it held a grand opening for the newly converted biodiesel refinery. By this past fall, it was operating at 50 percent and will mostly likely be at 105 million-gallons annual capacity by the end of 2008. There were several reasons why GreenHunter Energy was able to turn around the project so quickly.
. No permits were required because it was already a waste oil chemical refinery.
. Instead of using an outside contractor, they used internal management professionals.
. They were able to utilize about 60 percent of the existing equipment, such as existing infrastructure like barge facilities, pipelines for gas, water facilities, foundations, existing tanks, and other associated equipment. Although the biodiesel refinery can and has used a number of different feedstocks, including soybean, canola and off spec biodiesel, the primary feedstock has been poultry and beef tallow, in part because it's inexpensive. "Most biodiesel plants can't take animal fats. So we have very little competition for the feedstock," says Evans. And the biodiesel they are producing with this feedstock is extremely high grade. Evans credits their superior product to not only the equipment, but the processes they're using. "We currently have four patents being filed on our process." Finding customers hasn't been an issue. Most of the biodiesel produced is being transported to Europe, because this makes the most financial sense for their shareholders. "Transportation for us to Europe is about 19 cents a gallon and we're getting at least another 25 to 50 cents a gallon above that in the European market," says Evans. U.S. can't meet the minimum quality specifications of a European market." In fact, the company is in the process of trademarking its name- GreenHunter Biodiesel-so it will have its own brand. 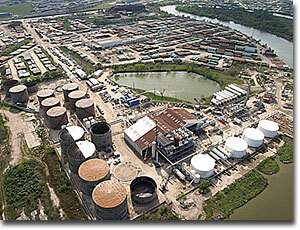 The refinery in Houston also has a bulk storage facility that can hold up to 700,000 barrels. Although GreenHunter has leased out some of the storage space to third parties, most of it is for the refinery's own use for feedstock supply storage, as well as finished product storage. The glycerin refinery, also part of the same complex, is in the process of being built and will be operational this winter. Up until now, GreenHunter has been storing its crude glycerin, but once the refinery's finished, they will bring the glycerin up to technical grade to increase its market value. Evans isn't sure who the glycerin customers will be at this time, but he's already talking to large international companies that wish to ship the product to China. The last piece of the refinery site is the methanol distillation system-methanol being a needed ingredient in biodiesel. Since its completion last September, GreenHunter has been taking off-spec methanol from cargo ships and cleaning it up. Evans is pleased with how the refurbishment was handled, and in a manner substantially less expensive than their competitors. "We typically like to buy things that are broken," says Evans. "If you look at the refinery, our two biomass plants in California and Florida, they were all previously broken. One plus one is three-that's what we like. We buy something broken, fix it, and it's a whole lot better than it was before." GreenHunter Energy may not care what shape the refineries are in, but they do care if they're near water. "I can assure you, you won't see us own any kind of plant or refinery like this [Houston] that's not on the water. Being on the water is absolutely critical." Higher oil prices aren't the reason behind GreenHunter Energy's quick rise. It has been Evans and his team's past business experience and skills. "We're in a very difficult capital market right now-the most difficult I've ever seen in my life. So having the ability to know how to access different forms of capital really separates us from a number of other startups," says Evans. Evans' track record with his previous company hasn't hurt either. "We went public in 1990 and sold it in 2005, and the average annual shareholder return was 37 percent," he says. "That creates quite a following because people like to get on the same horse, so to speak. And that's one reason our stock has been successful. People are betting on this management team. And as we continue to put the bolts on the wheel and prove that we have the knowledge and experience, people will continue to take notice." Credit also goes to the team's success in finding good deals. "You turn over a lot of rocks and you're trying to find a needle in a haystack," says Evans. And having the skills to negotiate those deals once you've found them is equally important. GreenHunter Energy's goal is to have $2 billion in assets in the next two or three years, which they are well on their way to achieving. "We would like to eventually convert this company to a master limited partnership (MLP) so that we would be the first alternative energy company that would allow individual investors to buy an MLP." An MLP would offer both tax benefits to investors and more access to capital for GreenHunter. "But to get that accomplished, there have to be some tax law changes," says Evans, and he and his team are working on that now. The company is forecasting that its current 63 employees will number over 150 by the end of the year-and it will have offices in Dallas, Houston, Austin, Minneapolis, and Louisiana. Evans is proud of the work so far-both in producing renewable energy and maximizing shareholder return. "Our goal is to make money quickly, which will also be a bit of an anomaly for this sector. There aren't a lot of companies making money, and the sooner we can start generating good revenues and income, then people will, I think, truly take a much closer look at us. "I believe 2009 will be our blossoming period and next year we hope to report around one billion in revenues from a startup of just a year-and-a-half ago, which is pretty dramatic." And judging by what they've accomplished so far, that shouldn't be too hard to achieve.